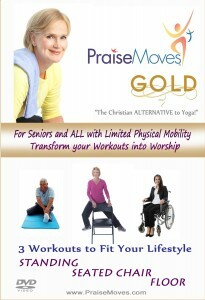 “Just wanted to say a few words about the blessings of PraiseMoves. I had been diagnosed with osteo-arthritis, Lupus, and a few other unwelcome conditions that made moving my body uncomfortable. Then about 5 or 6 years ago I began having a distinct pain in my right hip socket. Knowing that I needed exercise, my husband and I began taking walks of 2 or 3 miles everyday, but the pain in my hip caused me to limp. This past year brought even more pain in the hip and entire right leg and it was increasingly difficult to make myself go for those walks. “Enter PraiseMoves! After a few weeks of PraiseMoves Gold, the pain is completely gone! NolaJeanne, our instructor, concentrates on moves that bring mobility to joints and releases the synovial fluids that lubricate them. “How wonderful to be part of this group where one 49-yr-old testifies to being more flexible and fit than ever before in her life even though she once taught Yoga, swimming and ballroom dancing; one lady lost 70 pounds without substantially changing her eating habits, and another (age 66) has mobility and range of motion in a knee and shoulder that were basically frozen. “I love the camaraderie we enjoy in PraiseMoves, and wanted to express how PraiseMoves makes strangers into friends and friends into sisters. We all attend different churches, but the love of God has drawn us into a unity that seems rare in Christian circles today. “PraiseMoves benefits a person in so many more ways than the obvious physical toning and strengthening: my soul benefits as I renew my mind to the Word of God. Then I prosper and am in health according to 3rd John 2. – Linda House, Tahlequah, OK (NOTE: Linda is one of the PraiseMovers on our newest DVD, PraiseMoves Gold–filmed October 2012, release date December 2012. Subscribe to the FitNews in the box upper right and we'll keep you posted! ).